TAKING THE LEAD: "This is my chosen path. I'm gonna stick with it and leave something for those coming up after me," says the award-winning director, producer, actor and writer. After and eventful year filled with professional triumphs (new hit plays, several awards) and personal challenges (back surgery, a diabetes diagnosis), David Tulloch is ready to commence a fresh chapter. The 36-year-old playwright-producer sits down with TALLAWAH to talk about sharpening his focus, the joys of fatherhood, how his challenges have made him a better man, and this month’s long-awaited sequel to Jamaica Sweet. SURELY there’s no father-son moment more touching than this one: David Tulloch and his cute-as-a-button kid, Joshua, goofing off as the photographer snaps away, capturing some truly iconic images. The photoshoot to mark David’s first TALLAWAH cover story offered us the rare opportunity to see the ace playwright-producer outside the work zone, a glimpse of his fun daddy side for a change. Come to think of it, it was also a much-welcomed respite, given the eventful year he’s had – the artistic triumphs (new stage hits, Probemaster Hall of Fame induction) and the personal challenges, not excluding the operation on his back and being officially diagnosed a diabetic. What a year! Tulloch is not the kind of relentless achiever who lets any kind of setback slow him down or cramp his style. He keeps moving forward but reflection is paramount. “We travelled a lot this year, and we were happy to do that. Every year I’m expected to do at least nine, 10, 11 shows, but I did less this year because I wanted to spend more time nurturing the talents in the [Probemaster] camp. So we were touring with shows like Across the Bridge, White Skin Black Heart, Bad Breed and Wine & Roses,” the Probemaster Entertainment founder says, now seated behind his work desk, located a few feet away from the Blue Room (Phoenix Theatre premises) in New Kingston. 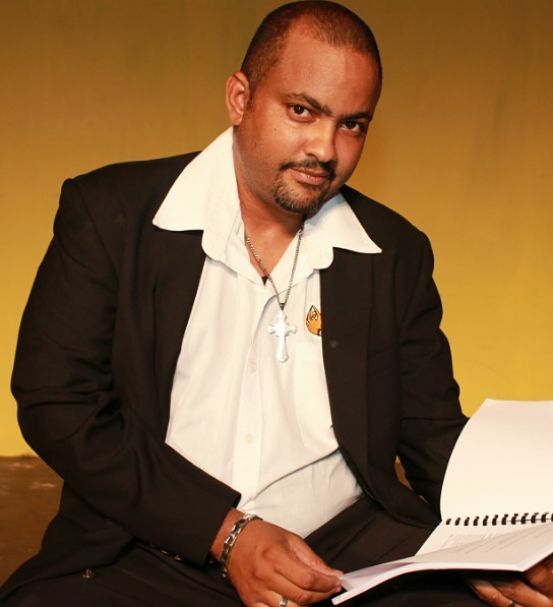 Running Probemaster Entertainment (which he started almost two decades ago) and overseeing day-to-day operations at the Phoenix (as manager) has put Tulloch smack in the middle of Kingston’s showbiz excitement, at a time of momentous change in the entertainment landscape. He couldn’t have asked for a more fitting, challenging, awesome job that keeps him on his A-game and on the tip of his toes. Inside Tulloch’s office you’ll find cherished memories framed on the walls, awards adorning the mantle, a selection of books, a work desk covered with evidence of his busy life and a sepia photo of a young, handsome David from the time he portrayed Jesus on stage. An artist works here. There’s absolutely no doubt. And what David Tulloch is working on at the present momemt is the long-awaited sequel to Jamaica Sweet, the clever and tuneful musical comedy revue that swept the Thespies three seasons ago. This month, Tulloch and the gang are back with Jamaica Sweeter, which promises to bring the laughs and, hopefully, some award-worthy performances. “It’s perfect for the holiday season and for those coming home and want to spend an evening at the theatre. I’m directing it. I’m composing the pieces. And we have quite a number of sketches completed already. If you liked Jamaica Sweet, you’ll definitely enjoy the sequel. It will be our December offering,” he boasts of six-hander, which will play at the Phoenix (starting December 22) before hitting the road in 2018. You totally see where she’s coming from. Amazing how Tulloch stands tall in the face of the health challenges that threatened to make him immobile. He did major back surgery in April to remove a disc from his spine and recently his doctor confirmed something he’d been dreading: he has diabetes. “It runs in the family, so I was heading down that path,” says the heftily built 36-year-old, who shed 35 pounds from his frame. “I changed my diet. I’ve become a lot more health-conscious.” Good for him.